That morning. Waking to the waft of pine tree perfume filling the air, the sharp clear light of a Mediterranean blue sky, and warmth – oh the warmth of the clement Southern France climate. How could I not paint it? While some people may consider a room with a view to be a vast vista over coasts and mountains, over city roof tops or wide country landscapes, for me, our little room at the Hotel de L’Horloge overlooking a quite old street with a verdant puissant pine tree thrusting into view, could not be beaten. 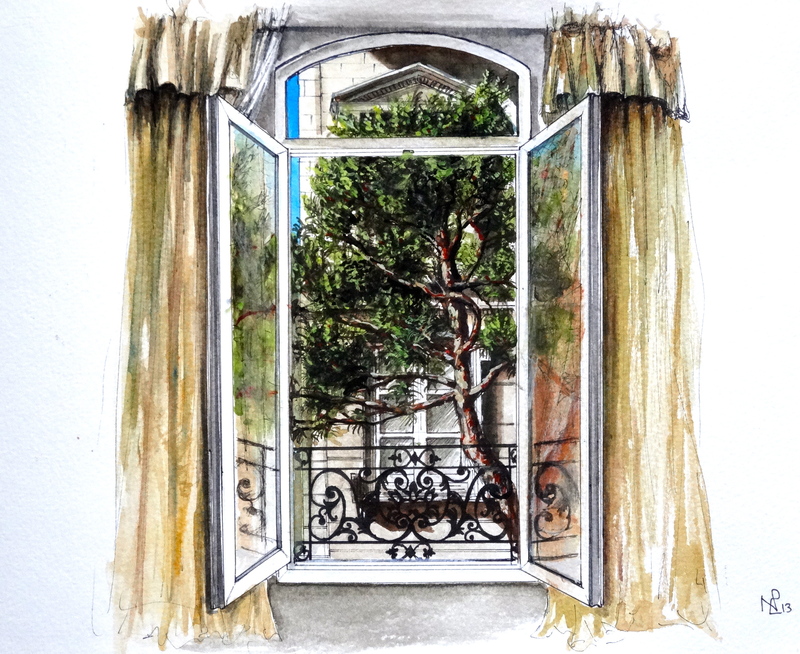 And as daytime dawned on our first Avignon day, I could not help myself but take out my little watercolour book and recreate the view and our wide open window in paint, capturing that moment as we welcomed, heartily, the exquisite outside in. Now, far away from Avignon, when I look at my painting, it carries with it the very essence of that view, and the feelings which arose within me when I gazed upon it in a way which no photo ever could. For in the process of its creation, I captured not just the view, but a manifestation of my reaction – my joy at that moment of Provençal awakening. It’s a simple painting, but loaded with our experience of those pure moments of unbridled joy, when a holiday begins, and days of carefree discovery lie in wait. More on Provence, coming soon. A glimpse of heaven. I love it.